Once again we have been remiss in updating our site, this time for a rather long five months. We last updated you during our last few weeks in Sydney, Australia. Today we are comfortably ensconced in Veronica's apartment in Paris, France. What happened and where were we in the intervening three months? When we boarded a plane to leave Sydney it was the beginning of a hectic but fascinating eleven weeks in South Africa. Soon after our arrival in Sydney, we had seen advertized a round-the-world fare from Sydney that would allow us to take in South Africa on our way to Europe and then return to Sydney via the United States. At the same time we were trying to decide what to do about the three-month limit on our visa to Australia. We loved Sydney, but wanted to explore further afield too. To get an extension on our visa required either leaving the country and coming back (perhaps to New Zealand) or jumping through some bureaucratic hoops and paying a substantial fee with no guarantee of success. While pondering this we received an email from our friend Veronica offering her apartment in Paris for spring/summer 2007. Knowing that this period included the presidential elections in France we were sorely tempted. When we put that together with the round-the-world fare the decision was fairly easy: We got out our calendar and sketched out a year's worth of travel based on the round-the-world fare that included almost three months in South Africa. And that was that. For our first few days in Johannesburg we rested (getting over jet-lag) and studied. Then we rented a Volkswagen Chico, which we found was ubiquitous, and drove and drove. We loved the trip. Our trip ultimately took in all but the far west and northwest of the country. We covered 11,000 kilometers and were in eight of the nine provinces of South Africa. We visited most of the major cities: Johannesburg, Pretoria, Durban, Capetown, Bloemfontein. We saw half a dozen national parks (Kruger, Ado, Mountain Zebra, Mkhuze, St Lucia, Karoo, Royal Natal) and a handful of state parks and parks in the independent enclave of Swaziland (Hluhuwe, Hlane). Apart from Swaziland we also visited the mountainous redoubt of Lesotho, another independent enclave. 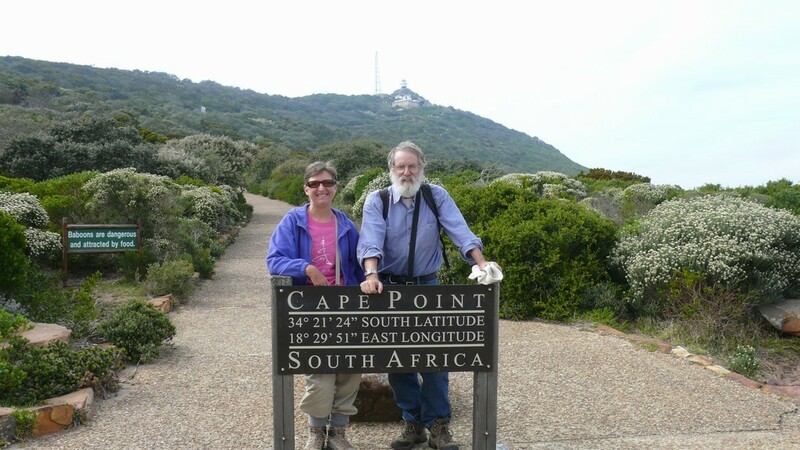 And of course we saw the beaches, the vineyards, the deserts, and the mountains, notably the Drakensberg of which we had heard many times over the years from Pam and finally got to experience with her during our last days in the country. It is a beautiful country and a great climate and by the time we left we understood the attachment of its people to their country. We got to Paris by an over-night flight via Frankfurt. Veronica's place was even better than ever, as she had extensively re-decorated. We are taking it easy after our busy time in South Africa. Our 1999 and 2005 visits allowed us to see all the major sites and museums; we'll do more this time, but on a hit-and-miss basis. Mostly we are just kicking-back and enjoying having a kitchen at our disposal, being able to do laundry whenever necessary, and having access to the web on an always-on basis. We have renewed our library cards and are combining two of our great loves by spending lots of time in parks and gardens eating baguette sandwiches and reading! Maybe soon we will, as we did in Sydney, have bikes and travel around on VTTs (velos-tout-terrain). As noted we came to Paris in part because we are poltical junkies and wanted to see the Presidential election up close. (In 2005 we spent hours and hours following the European Constitutional Referendum.) We have already managed to get Nicolas Sarkozy elected President of France now look forward to nudging along the legislative elections too.